The duck population are partying today! Time for me to stay inside and enjoy a virtual vacation visiting all of you, and catching up with what I’ve missed. Everyone has been busy in the kitchen, I’ve been visually overindulgent soaking up all the new recipes and fresh and seasonal produce that I’m seeing around the country, and I never have enough time to catch up with all the great photographers and their textured Art. As I was unable to acknowledge the last award I was given,( Versatile Blogger) I thought I might acknowledge this person in this the Seven Link Challenge, so you could all visit her and see her talents. She’s number one on my list of bloggers. Initially I learnt about this challenge from Mandy over at her blog The Complete Cookbook, her knowledge and cooking has inspired her book, with the second edition available soon. Her Seven Link Challenge can be found HERE. These are my entries to these seven categories. How many do you remember? 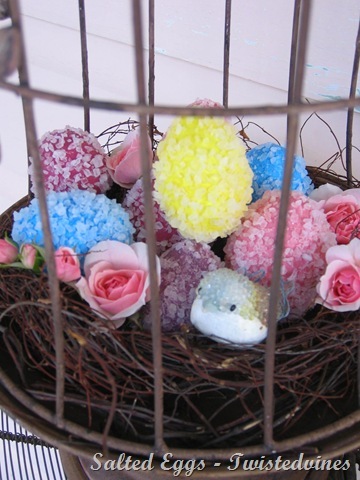 I had fun creating these salted eggs for an Easter display to the entrance of the house.Tutorials do take abit of extra effort and time, but they seem to catch everyone’s eye…and who can resist a bit of added colourful fun to have with their children over Easter break. I really don’t think I’ve written anything too controversial…I have had a personal conflicting comment thrown my way…but all in all ‘it’s not worth it’…is their glass half empty? Maybe there might be conflicting views over this post: A Hunting we will go…however this post was an introduction to a wonderful recipe called Chicken Cacciatore. Summer Tutorial: I so enjoy changing each season throughout my house, and in the garden for those outside entertaining evenings. There have been many ‘ beautiful’ posts, I love capturing the romanticism of my heart, my feminine side and all those dainty and whimsical moments. For me, Springtimes Laughter I so enjoyed taking an overload amount of photo’s and creating for me a picture book of Springtime emotions. This post received an extra amount of traffic, and it’s the simplest recipe, however one of those old favourites…Lemon Meringue Pie…I really believe it’s so important to have a new original and catchy title to your post…a little intriguing ‘Citrus Gold’ ! This post was a ‘way back then’, I was so enthusiastic about this dessert and in awe of the magnificent colour of the mulberries that I still get an adrenalin rush…I’ll have to do a ‘revisited’ on this one and see whether I can get you all enthusiastic as I was back then! I’d have to say Sandy’s Tea Society it’s the first time I contributed to Food for Thought which is an edible book review. I’m so appreciative of Mary over at her blog ‘Home is Where the Boat is’ who introduced me to this link. Although I haven’t found time now to do another book review of this type…I hope to contribute in the future. You seem to take on a masters hand with creativity…and I was just bursting to style and create interpretations of this book through my photography and food concepts. I’m very proud of this post. 1. Rita from The Culinary Taste. 2. Alexandra from The Art of Afternoon Tea. Alexandra is a talented illustrator/ artist. She illustrates her favourite past time of afternoon tea, cooking, and teacups. Her detailed illustrations of fancy afternoon teas of biscuits,cakes,teapots and pearls just jump out of the page to the reader. And she doesn’t leave any details untouched. A pleasant surprise. 4. Crustabakes is a great blog and has been freshly pressed a couple of times. ‘G’ is a donut and nutella lover and loves her time making magic in the kitchen, you’ll find some great recipes and clear, up close photography. Yvette, thank you so much for such a lovely mention and link. I loved reading your 7 links – you always have such beautifully photographed posts. I still remember those lemons! What a great roundup. I’m really enjoying seeing everyone’s approach to this. It was a memorable post…those lemons! I really enjoy viewing blog owners showcasing their old post this way. 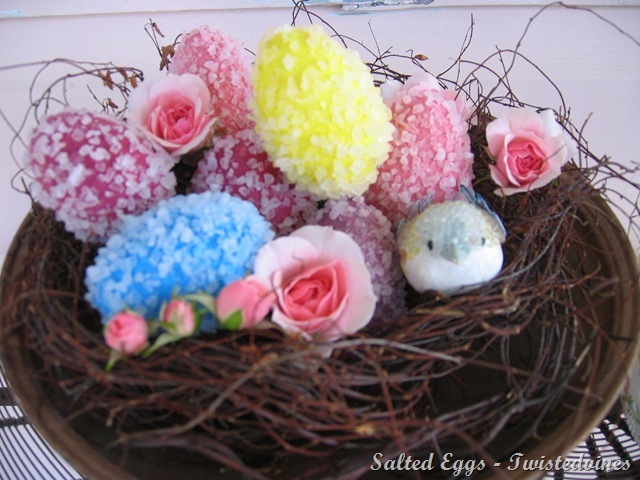 I can say I absolutely loved the salted eggs post. And I found a new post I like which is the most underrated dessert. Hi Yvette! Thanks So much for the kind words on Crustabakes! I am currently away on a holiday right now ! But i will definitely pass on the seven link challenge when i get back! Thank yo so much Yvette for this special mention!!! Yes, I’m busy, busy, busy and I can’t catch up all the news from bloggers. Poor me!! Thank you again! I’m gpoing to make my Se7en Link Challenge post soon! !